July 12, 2012 - Hawker Beechcraft Corporation (HBC) announced it is using the Farnborough International Airshow to gauge the market for its Baron G58 ISR. 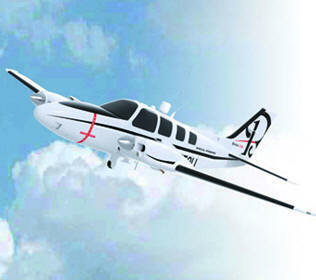 The company will display a model of its Beechcraft Baron airframe outfitted with mockups of Intelligence, Surveillance and Reconnaissance (ISR) sensors, including an electro-optical/infrared (EO/IR) camera and data link, at its chalet during the airshow from July 9-12. “HBC has long served the ISR markets with our range of economical and reliable Beechcraft King Air turboprops and Hawker jet platforms,” said Jay Gibson, HBC vice president, Special Missions. “As the global ISR market continues to evolve, we have recently seen interest in Latin America and island markets for a light aircraft with ISR capabilities. We are using the Farnborough Airshow as a starting point to develop a wider market for the solution we are offering. The Baron G58 ISR aircraft offers the reliability of twin engines, a max cruise speed of up to 352 kilometers per hour (190 knots), a range of 2,788 kilometers (1,500 nautical miles) and a service ceiling of 6,306 meters (20,688 feet). This allows operators to reach mission areas quickly and safely, flying above weather rather than through it. The aircraft’s basic surveillance package includes: an EO/IR camera package with a 9-inch or 10-inch diameter turret, controller and monitor; a mission management system with mapping capability for situational awareness; a high-definition imagery recorder with playback that records metadata; and a V/UHF radio for tactical communications. Surveillance options include a line-of-sight and/or satellite data link; search and rescue direction finding; and an automatic identification system for maritime surveillance. All of the surveillance mission equipment for the Baron G58 ISR is commercially available with short lead times and high reliability. While the physical integration of the mission sensors to the airframe is highly specialized (with significant consideration to human factors), the mission package integration is done without specialized software, making it easy to troubleshoot and maintain in the field. “This is a great aircraft for entities that have ISR mission responsibilities and are looking an economical solution to meet those needs,” Gibson said. “Not only is our concept the right size with the right equipment, you get all of the benefits of the legendary Baron – it’s all-weather, fast and supported throughout the world.” More than 6,700 Barons have been produced to date and Hawker Beechcraft Parts & Distribution maintains a large inventory of spares around the world.